This fundraiser is set up on behalf of a group of writers and illustrators, led by Nicola Davies and Jackie Morris, working with bookseller, Tamsin Rosewell. The funds raised will buy copies of a picture book called The Day War Came that will be sent to the UK Parliament, to key decision makers with the aim of better informing them what a lone child refugee faces. As a group of writers and illustrators we are very aware of the power of words and images to extend our understanding and empathy beyond our own experience. We do not all have first-hand experience of war – there is all the difference in the world between an intellectual grasp of complex world politics and being equipped to make a judgement on behalf of a child who has witnessed unimaginably horrific events. We would like, therefore, to raise the funds to send out 100 copies of a new picture book to key decision makers in and around Parliament. 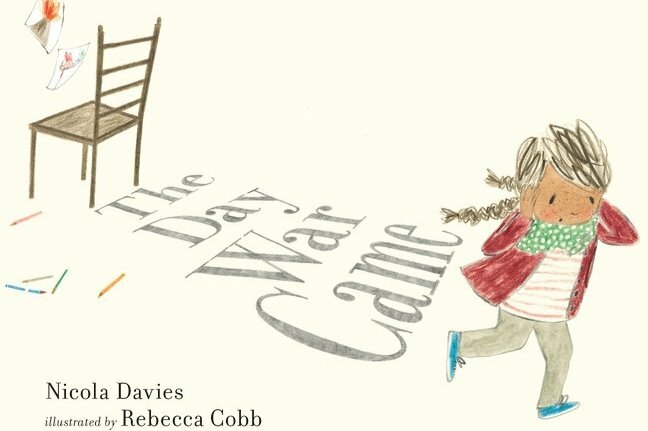 The Day War Came, by Nicola Davies and Rebecca Cobb shows the world of a young girl caught up in war in Syria, and her need to flee the country alone. We believe that the Home Office needs to reinstate The Dubs Scheme to support, protect and accommodate lone child refugees - and we offer our support to Help Refugees UK, to Lord Dubs and to others who are pushing for this matter to be addressed now as a matter of great urgency. There is one almost universal misconception about picture books, and that is in the assumption that they are just for children. Picture books are for the space that adults and children occupy together; in fact they are some of the only books that are read by, and form a conversation between, an adult and a child. They enable us to understand and discuss the true purpose of social ideals like solidarity, partnership, friendship, responsibility and kindness. Picture books help us to extend our intelligence beyond the limits of our own experience. Those who voted in Parliament against the protection and accommodation of 3000 lone child refugees, and those recently who sought to close the Dubs scheme to allow them safe passage, were perhaps not equipped with sufficient understanding of what those children had experienced and the duty they had to ensure their safety. As one of an international coalition of countries that made a political judgement that it was necessary to engage in this war too, our understanding, both intellectual and emotional, should have been that it was also incumbent on us to provide sanctuary to those displaced both by our own actions and by the violence of those we sought to obstruct. In a very different way, these events are also about the relationship between adults and children. We hope that this book will help those who have the responsibility to make these decisions to imagine if, on an ordinary day in their own childhood, the war came. To convey these events in picture book form does not trivialise them, it does the reverse: it moves the discussion into that vital space in which one generation and the next listen to each other, allow images to inform them and, together, begin to understand what life is like beyond the constraints of what is familiar personally – in this case, what it is like to be displaced by war, and to be assailed by the culture of suspicion that we often create around those refugees who do arrive here. Empathy and emotional intelligence are not a ‘nice to have’, an optional extra in politics, secondary to the skills of oratory or analysis, they are skills vital to our political system. Lack of ability to empathise is identified as a huge risk factor within the business environment, and when it comes to judgements made by politicians and their advisers, the risk is even greater. As Parliament prepares to return to its current session it is vital that the matter of the treatment of lone child refugees is not allowed to be forgotten within the maelstrom that is our own current domestic politics. As a nation we have a responsibility to sustain this campaign and let it be defined by hope and by compassion, not by ignorance and intolerance. This war is not over, there will be more refugees; and it is our responsibility to help them to rebuild – and to move now with speed and purpose. Fiona Dunbar – author and organiser of Authors for Refugees Auction.